Burchell's Zebra may refer to two kinds of Zebra. It may stand for the Plains Zebra in general. In the narrow sense, Burchell’s Zebra may stand for one of the subspecies of Plains Zebra, native to South Africa, that was once believed to be hunted to extinction, but recent research affirmed that it is still abundant on many game farms. In the general sense of the term, it can refer to all southern populations of the Plains Zebra, that are hunted in Botswana, Mozambique, Namibia, South Africa, and Zambia. The most affordable Burchell’s Zebra hunting opportunities are to be found in Botswana, where the trophy fee can be as low as $500. Since it is the skin, and not antlers and horns, that is the trophy of a Zebra hunt, cull hunts are good options for Zebra hunting. In Namibia the trophy fees for Burchell’s Zebra average about $1,000, and in South Africa a few hundred dollar more. Hunting opportunities in the wilder and more remote destinations in Mozambique and Zambia are the most expensive. When to hunt Burchells Zebra? Hunting opportunities for Burchell’s Zebra exist all year round. However, in a large part of its range, hunting is uncomfortable because of weather conditions during the summer and the wet season, that is, from November to April. Many nations even have the hunting season closed at these dates. Most outfitter suggest to schedule plains game hunts to the last months of the dry season, that is, August to October. Burchell's Zebra, like all Plains Zebra, prefer wide open plains with grass for grazing and water not too far away. They live in family groups, either a stallion with a harem of mares and their young, or bachelor groups of males. Often a number of family groups join together to form a big herd that may number hundreds of animals. The Zebra don’t rely on “hide” strategy to escape predators; as soon as one animal senses danger, it gives an alarm call, and the whole herd takes flight. This makes them a very challenging object of spot-and-stalk hunting. A hunter must be ready for a quick long shot, and quick long shots on windy African planes can be quite challenging. Bowhunters often choose to wait for the Zebra in blinds over waterholes. The skin of the zebra is one of the most popular trophies that hunters bring home from African safaris. The pattern of stripes is unique for each individual animal, and also differentiates subspecies. Burchell’s zebra usually have lighter-colored “ghost” stripes between major bold stripes, giving this subspecies a unique look. Zebras are not served as meals at every hunting camp, but many hunters who tried it say that it’s some of the tastiest flesh they’ve ever eaten. Zebra hunting offers a unique challenge and a different edge to your plains game safari, and the striking black-and-white stripes, whether as a carpet on the wall, a rug on the floor, or a piece of original taxidermy, will be a constant reminder of the experience - and an endless inspiration to think about enigmatic Africa. Following old Hartmann Mountain Zebra paths through the rough granite kopjes and mountains, you feel the freedom and isolation in this remote destination in north western Namibia offering TRUE FREE RANGE hunting. We constantly do research for some of the best concessions in order to source the best quality trophy animals for our clients. IVORY CAMP HUNTING CONCESSION is located in north western Namibia and is a wilderness area without fences, where game can truly roam free. ELEPHANT herds quite frequently roams through this area, as they are not harassed firstly and secondly the concession has large open waters, which they quite frequently visits. Hunters can expect to see elephant during their hunts. Our company is committed to and promotes Old Style Authentic Hunting experiences, thus we have very strict ethics when it comes to the hunt itself. We believe in the whole hunting experience, therefore we promote quality trophies, rather than quantity. Each of our hunts are individually planned, and we scout our concessions before every hunt. We also operates with a small staff compliment and do all our hunts personally. Each hunting party have the entire concession to themselves. We never mixed clients. This is a minimum 6 hunting days for plains game safari we offer on our hunting ranch called Ivory Camp. All hunting is done on foot. 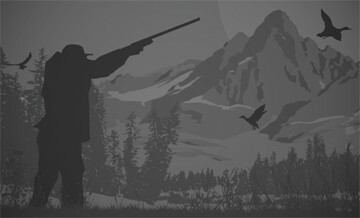 Day of arrival and day of departure does not count as hunting days. Excursions can be organised to Etosha National Park which is a mere 90 minutes drive away as well as visits to a traditional Himba village or cheetah farm.